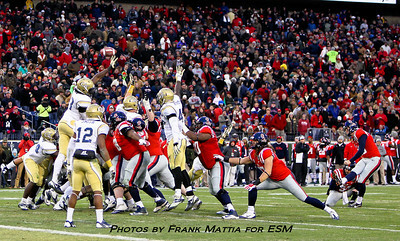 Mississippi Rebels wide receiver Donte Moncrief (12) goes up for a pass in the first half during the Music City Bowl game between Ole Miss and Georgia Tech at LP Field in Nashsville, Tennessee. 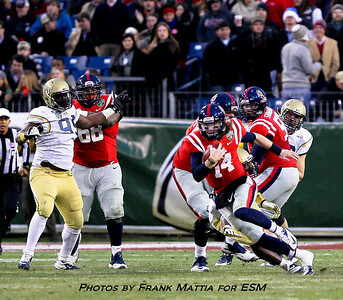 Ole Miss leads 13-7 at the half. 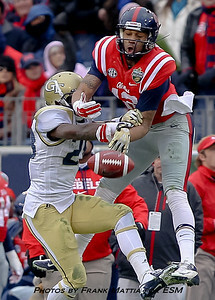 Mississippi Rebels wide receiver Donte Moncrief (12) goes up for a pass but can not pull it in during the game the Music City Bowl game between Ole Miss and Georgia Tech at LP Field in Nashsville, Tennessee. 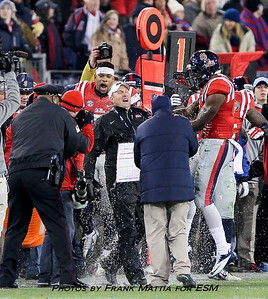 Ole Miss leads 13-7 at the half. 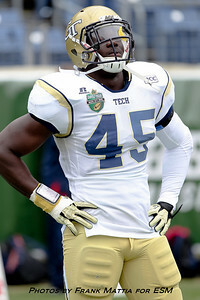 Georgia Tech Yellow Jackets defensive end Jeremiah Attaochu (45) warms up before the Music City Bowl game between Ole Miss and Georgia Tech at LP Field in Nashsville, Tennessee. 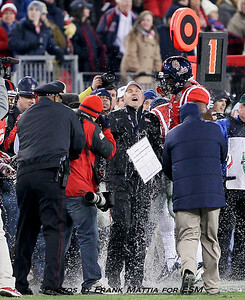 Ole Miss leads 13-7 at the half. 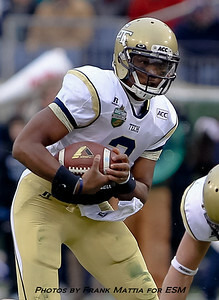 Georgia Tech Yellow Jackets quarterback Vad Lee (2) keeps the ball and runs for a first down during the game between the Carolina Panthers and the Atlanta Falcons at The Georgia Dome in Atlanta, Georgia. Carolina defeats Atlanta 21-20. 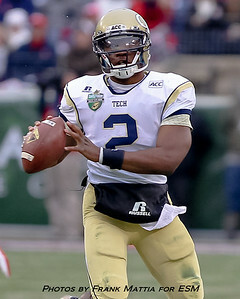 Georgia Tech Yellow Jackets quarterback Vad Lee (2) throws the ball on the run in the first half during the Music City Bowl game between Ole Miss and Georgia Tech at LP Field in Nashsville, Tennessee. 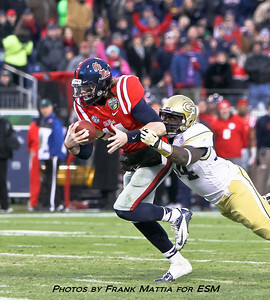 Ole Miss leads 13-7 at the half. 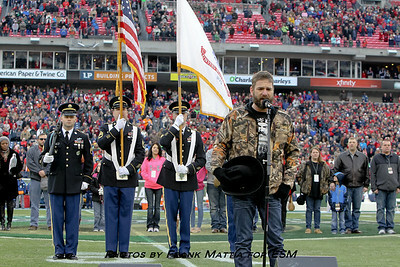 Country music singer Craig Campbell sings "God Bless America" before the Music City Bowl game between Ole Miss and Georgia Tech at LP Field in Nashsville, Tennessee. 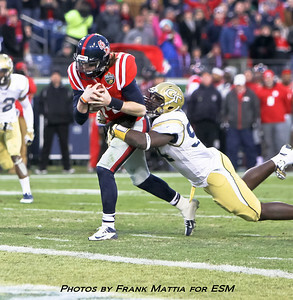 Ole Miss leads 13-7 at the half. 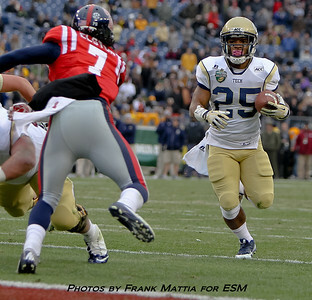 Georgia Tech Yellow Jackets running back Robert Godhigh (25) runs around the left side into the end zone during the Music City Bowl game between Ole Miss and Georgia Tech at LP Field in Nashsville, Tennessee. 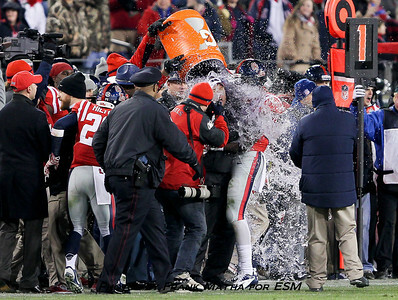 Ole Miss leads 13-7 at the half. 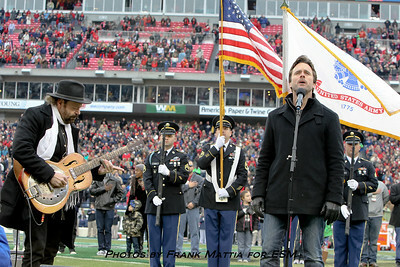 Charles "Chip" Esten of the ABC hit TV show Nashville sings the National Anthem with Colin Linden playing guitar before the Music City Bowl game between Ole Miss and Georgia Tech at LP Field in Nashsville, Tennessee. 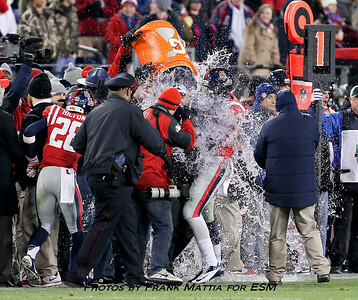 Ole Miss leads 13-7 at the half. 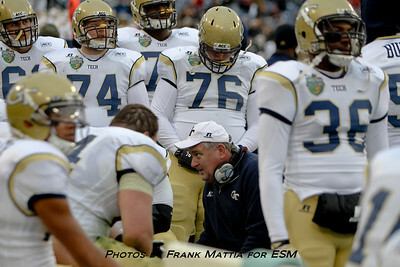 Coach Mike Sewak talks with his offensive line during the Music City Bowl game between Ole Miss and Georgia Tech at LP Field in Nashsville, Tennessee. 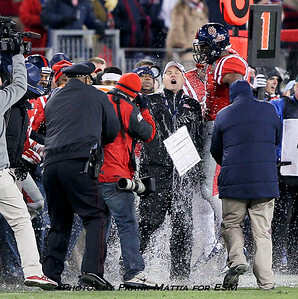 Ole Miss leads 13-7 at the half. 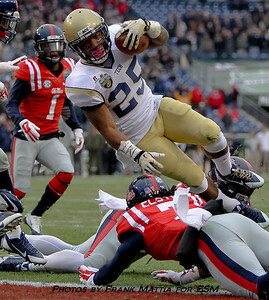 Georgia Tech Yellow Jackets running back Robert Godhigh (25) celebrates in the end zone after scoring a first half touchdown during the Music City Bowl game between Ole Miss and Georgia Tech at LP Field in Nashsville, Tennessee. 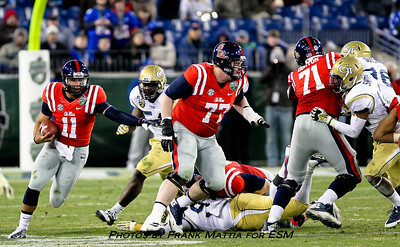 Ole Miss leads 13-7 at the half. 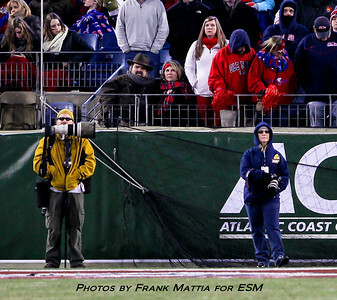 during the Music City Bowl game between Ole Miss and Georgia Tech at LP Field in Nashsville, Tennessee. Ole Miss defeats Georgia Tech 25-17. 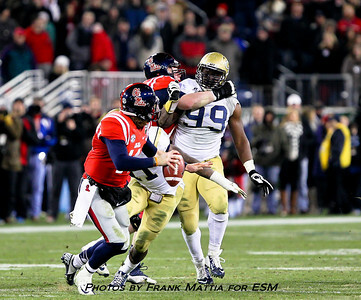 Mississippi Rebels quarterback Bo Wallace (14) on the keeper for a touchdown in the second half during the Music City Bowl game between Ole Miss and Georgia Tech at LP Field in Nashsville, Tennessee. 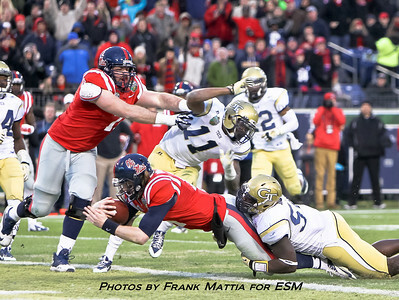 Ole Miss defeats Georgia Tech 25-17. 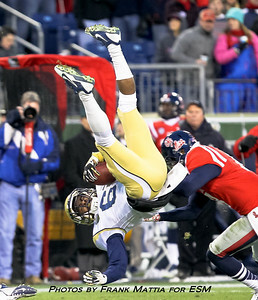 Georgia Tech Yellow Jackets offensive linesman Ray Beno (64) goes head over heels in the second half during the Music City Bowl game between Ole Miss and Georgia Tech at LP Field in Nashsville, Tennessee. 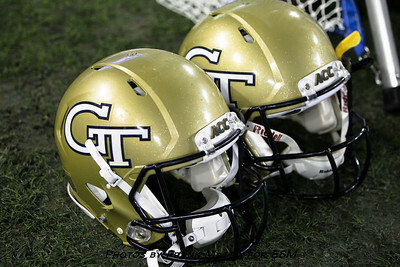 Ole Miss defeats Georgia Tech 25-17. 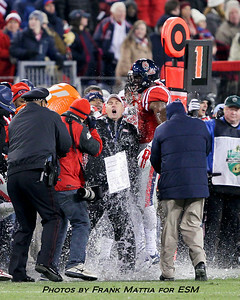 Mississippi Rebels head coach Hugh Freeze was just a little bit colder after getting a Gatorade shower after the Music City Bowl game between Ole Miss and Georgia Tech at LP Field in Nashsville, Tennessee. Ole Miss defeats Georgia Tech 25-17. 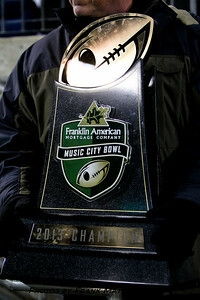 The trophy that Ole Miss will take home after the Music City Bowl game between Ole Miss and Georgia Tech at LP Field in Nashsville, Tennessee. 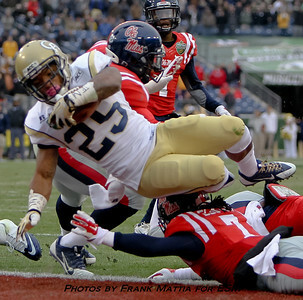 Ole Miss defeats Georgia Tech 25-17.